With the removal of the Beauregard Pedestal, two Confederate monuments remain following Mitch Landrieu’s self-promoting 2017 removals. The site where the Jefferson Davis statue stood still has a base and the mound and column at the center of Lee Circle remain. These two belong with the accompanying statues. If anyone else adorns them, they will always be referred to as Lee’s column and Davis’ pedestal’s base. 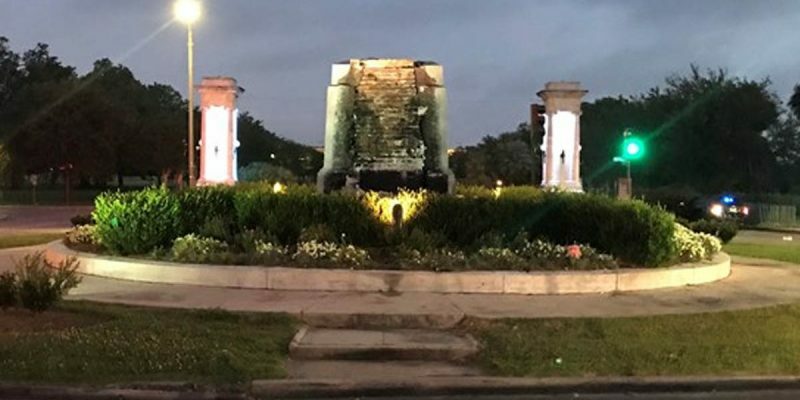 City Park’s removal of the Beauregard monument pedestal is one more step in the direction of erasing New Orleans’ past. The Confederaphobia-infected city leaders have made alterations to cleanse New Orleans of its Confederate ties. The city has been making these changes for 25 years. Each new generation grows up thinking: New Orleans is not really a Southern city, it’s its own city. But that is not true. New Orleans was very much a part of the Confederacy and the Southern cause. The street names are the most enduring landmarks to date. The Take Em Down NOLA Marxists want to change those. But as of 2018, the streets still tell the story of historic New Orleans. The monuments to Robert E. Lee, Jefferson Davis, and G. T. Beauregard stood as symbols of a major war that involved the invasion of the Southland and includes the foreign occupation of New Orleans and battles that took the lives of thousands of its residents. The North may have won the War for Southern Independence, but the memorials and scars should be on display. The Southern leaders that Mitch posthumously convicted faced previous culture cleansing in the Crescent City. City authorities changed the names of several schools during the 1990s. Jefferson Davis Elementary School on Grant Street was renamed in March 1993 for Ernest “Dutch” Morial, New Orleans’ first recognized African-American mayor although Moon Landrieu technically holds that distinction. P.G.T. Beauregard Junior High School was renamed Thurgood Marshall Middle School after the first black Supreme Court justice. Robert E. Lee Elementary School was renamed for Ronald McNair, the black astronaut killed in the 1986 Challenger explosion. Judah P. Benjamin School, named for the Jewish local who served as a U.S. Senator then in the Confederacy as Attorney General, Secretary of War, and Secretary of State. The school named for Benjamin was renamed for Mary McLeod Bethune, an African American educator who started a school for black girls in Florida. Adolph Meyer School, named for the Jewish Confederate officer who later was elected into the U.S. House of Representatives for Louisiana, was renamed for the abolitionist Harriet Tubman. A glaring insult from the educational representation of New Orleans was changing the name of George Washington Elementary School on St. Claude Avenue to Charles Richard Drew Elementary School, after a black surgeon who fought to desegregate blood transfusions. The cleansing in the 90’s was mostly down racial lines with names of white people removed and replaced with names of black people, but it did extend to New Orleans’ best kept secret: black slave owners. The school named for Marie Couvent, who founded an orphanage in New Orleans in the early 1800s, was renamed A.P. Tureaud after the civil rights lawyer. The group that initiated the effort ignored slave owner Thomy Lafon, likely because he was black. The organization behind the changes in the 90’s was the Afro-American Liberation League and at its head was none other than Malcolm Suber. Just like with Take Em Down NOLA, the Afro-American Liberation League produced a “Hit List” of schools back in 1990. Before Mitch Landrieu coopted Suber’s latest venture in Take Em Down, an evaluation of the schools following their name changes would have been a way to gauge the prior progressive cleansing. “To maintain these names is another badge of inferiority slapped on your children,” Suber said in June 1990. The School Board voted to alter the names of the public schools in December 1992, just before the end of the members’ term. Same pattern as Mitch waiting until the end of a term to make radical changes. Other changes have taken place that dilute New Orleans’ ties to its Southern roots. For one, the Confederate veterans home on Bayou St. John is long gone. Another Confederate tie now nearly gone was the observance of Robert E. Lee day in January each year. The federal government recognized Martin Luther King Day for the first time in 1986 and since then the Southern holiday has been largely phased out. Critics argue the Confederate States of America only lasted 4 years, and New Orleans was occupied for more than half that time, so it doesn’t have strong Confederate ties. But Union occupation does not mean Union allegiance. Ultimately New Orleans was occupied for 15 years and the Battle of Liberty Place was a significant event in the city’s past in which citizens revolted and attempted to overthrow foreign rulers. Grace King once said, “Reconstruction was also the war.” King lived through the war and Reconstruction, and applying her observation to the times, New Orleans was at war from 1861-1877. New Orleans was Confederate, it cannot be denied. Beast Butler hanged New Orleanian William Mumford for his part in taking down the Union flag in New Orleans in 1862. The Union’s Woman’s Order instructed American troops to treat New Orleans women like prostitutes. An estimated 12,000 New Orleanians fought in General Lee’s Army of Northern Virginia as part of the Louisiana Tigers. The port of New Orleans was a hub for the slave trade. Since the early 1990’s New Orleans has been pressure washing its past. The children of the multi-generational New Orleanians will grow up not knowing the historical marks of New Orleans as a Southern city, a city with deep Confederate roots. And the wave of transplants that have flooded New Orleans the last ten years, don’t know the true context of the city’s tumultuous past, that of public schools singing Dixie 100 years after the war, Rebel mascots, and all. Instead of teaching history, New Orleans has chosen to erase it. No compromise, no tolerance. This is what Liberals want. Only time will tell if a revival of the true history of New Orleans will resurface—based on education, understanding, and respect not the inaccuracies, sweeping generalizations, and hatred whipped up by progressives. Until that time, revisionism must be opposed.